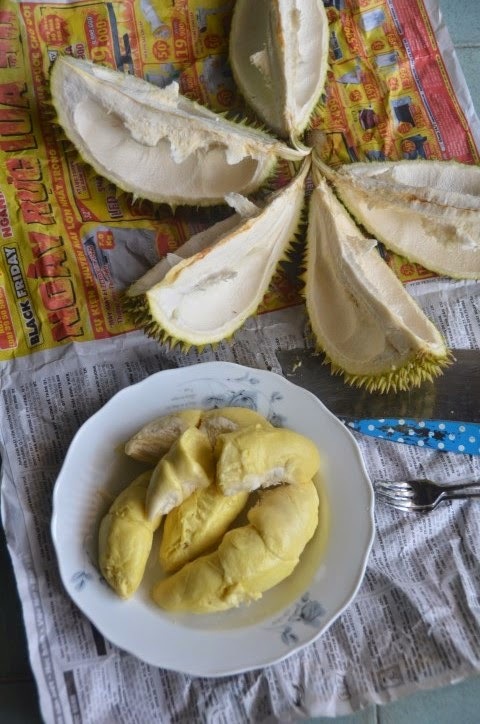 Durian may be dubbed the "king of fruits" but I doubt that it makes it on everyone's top 10 favorite fruits. As for me I enjoy the sweet and buttery taste of these fruits. I also do not find the odor to be offensive. 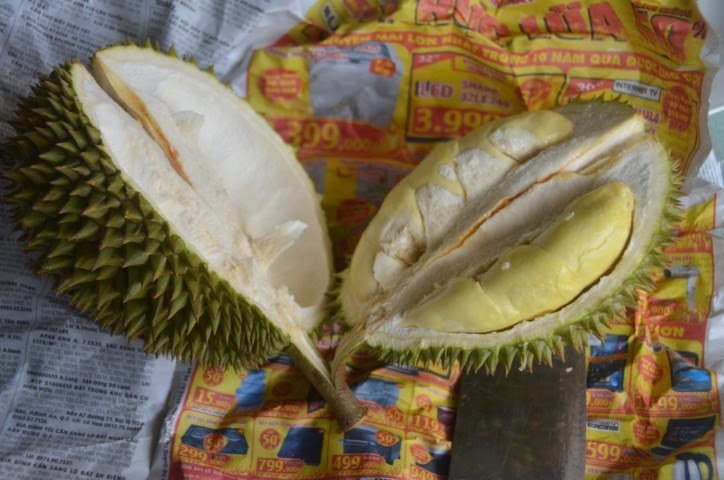 However, one of my High School science teachers, Mr. Harrington tells me he finds durian to be "the most repugnant fruit on earth". Here is his impression: "On my travels through India and Thailand eating everything from goat brains to jellyfish, durian was the one thing I could not eat. I tried it but it just wasn't happening for me." When I asked him to elaborate so people who have never had this fruit can understand why he does not enjoy eating it, he wrote: "(It was the) smell, texture and taste, it was the triple whammy for me. The odor was a very pungent, the nearest I can compare it to is that of butyric acid which is what gives rancid (oxidized) butter a foul smell. The texture was very sticky and gluey, while the taste was very hard for me to describe but just had no appeal to my taste buds. Perhaps because I had never encountered anything like it. Of course my experience with it was inside an enclosed vehicle on a hot humid day in Thailand..."
Years ago my husband and I rented a scooter and rode it all over the island of Koh Samui (Thailand). 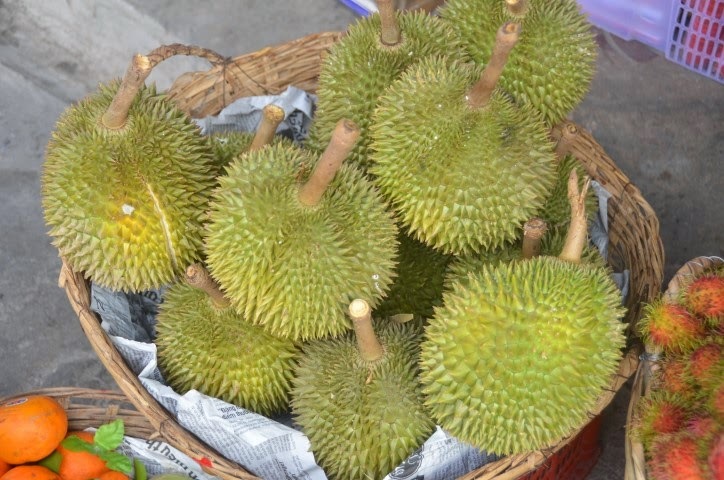 I was pleasantly surprised when we approached a huge durian farm along the way. Of course we had to stop and purchase a whole fruit, I can't get it as fresh as these! The seller happily opened the durian for us and we sat on top of the mountain eating the entire fruit while watching the setting sun. I think that was the best tasting durian that I had ever eaten. My husband did not grow up eating this fruit but somehow he is able to eat it and tolerate the smell. Thank goodness because I really like eating and cooking with them! I have to admit there is a minor skill in opening a durian with your bare hands without drawing blood! However, I highly recommend that you wear good work gloves (preferably leather) when handling these spiky fruits as a prevention from injuries when prying it open (especially if you are a novice). Pick a fruit that is ripe (typically indicative by the strong smell) and one that is slightly cracked (see photo below--bottom left durian). Take a knife and pierce into one of the sections that is slightly opened. Carefully open it and scoop out the meat gently using a fork, knife, or your fingers. Remember to remove the meat from every sections of the fruit. You can eat it as is but I prefer to wrap the meaty part, chill it in the refrigerator (or even freezer if you want to eat it quickly) and eat it cold. You can also make a smoothie, ice cream, creme brulee or other interesting desserts with it. 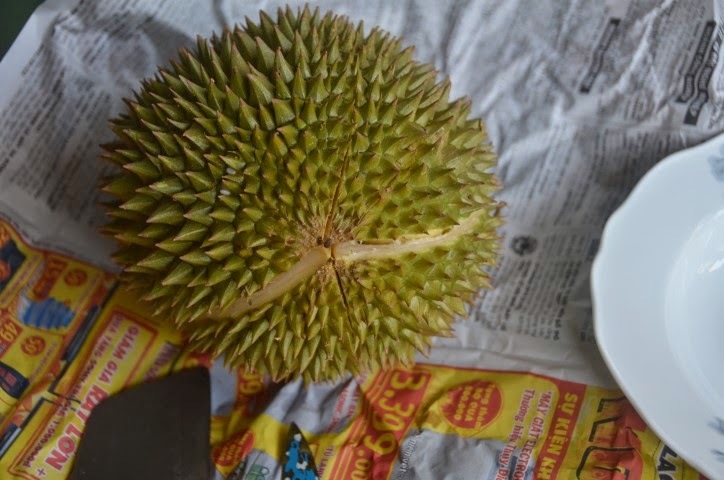 You may wrap it tightly or use a foodsaver vacuum sealer to store the durian meat and keep it in the freezer for months. 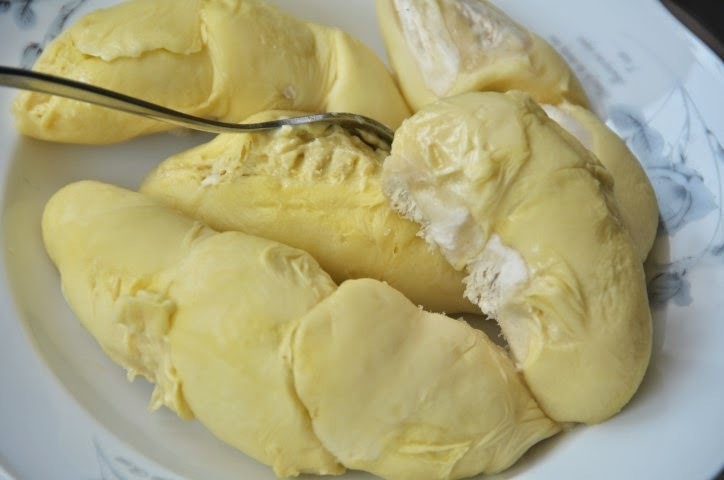 If you go to the Asian markets in the United States, especially the ones located in the Northeast you will see frozen pre-packaged durian in the freezer section. --the spikes are very deadly!! --remember to take out all the meat in the fruit!